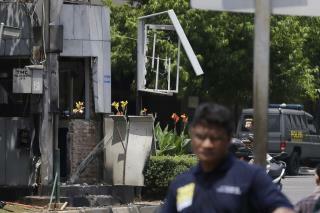 (Newser) – Attackers set off explosions at a Starbucks cafe in a bustling shopping area in Indonesia's capital and waged gunbattles with police Thursday, leaving bodies in the streets as office workers watched in terror from high-rise buildings. Police said five attackers and two civilians were killed, while 10 people were injured in the brazen attacks, which followed several warnings in recent weeks by police that Islamic militants were planning something big. It was unclear if any perpetrators remained at large. Five hours after the major downtown street in Jakarta—not far from the presidential palace and the US Embassy—turned into a battleground, police declared the area secure. Put the Numbers in Perspective. Islamic Terrorists... Killed twice as many people in one month (5000 in November, 2014) than were killed in in 350 years of Inquisition (2000-3000). Murder more people everyday than the KKK has in the last 70 years (26 since 1945). Killed more civilians in two hours on September 11th (2977) than in the 26 years of sectarian conflict in Northern Ireland (2236). Massacred more Iraqis on a single day in June, 2014 (1566) than the number of criminals executed by America in the last 40 years (1423). Slaughter more people everyday than were killed during the entire Salem Witch Trials (12). It's like the devil has risen or sent his roaches from hell... pure evil. All nations need to start calling these satanist's like Satan-IST or Devil-ISIS. See them for what they are...pure evil. and not part of any religion. Mr Obama thought ISIS was on the run!